Documentary telling the unexpected story of how arguably the greatest work of English prose ever written, the King James Bible, came into being. Author Adam Nicolson reveals why the making of this powerful book shares much in common with his experience of a very different national project - the Millennium Dome. The programme also delves into recently discovered 17th century manuscripts, from the actual translation process itself, to show in rich detail what makes this Bible so good. In a turbulent and often violent age, the King hoped this Bible would unite a country torn by religious factions. Today it is dismissed by some as old-fashioned and impenetrable, but the film shows why, in the 21st century, the King James Bible remains so great. It's an excellent documentary, compelling told, beautifully and colourfully filmed with shots of Oxford, Cambridge and London. It delves into the political dimensions of the translation at the same time as celebrating its scholarship and poetry. Strongly recommended. The programme was first broadcast on Monday and it is repeated next Wednesday, 2 March. It is available on the iPlayer for several more days. If, like me, you are outside the UK, you'll have to use some jiggery pokery to access it. There was no need to panic. The NT Gateway went back online again earlier today, with thanks to Adam at Logos for getting to it so quickly. Total Depravity in the Pagan World? It is in any case a grave error to think of the ordinary man in the Roman Empire as a depraved and cruel fiend, dividing his hours between the brothel and intoxication, torturing a slave from time to time when he felt bored, and indifferent to the suffering and poverty of others. Johnson does not give the precise reference, but it appears to be Arthur Darby Nock, Conversion: The Old and the New in Religion from Alexander the Great to Augustine of Hippo (Oxford: Oxford University Press, 1933), 218. I don't know what is going on but for some reason the NT Gateway has disappeared. It has been hosted by Logos Bible Software over the last couple of years, so I have got in touch with them to ask them if they know what is happening. I will, of course, post an urgent update here as soon as I have more. As a temporary measure, you can access the old site at archive.org, but I hope to have more news soon. The most negative book review in our area? I always thought that it would take a lot to unseat Peterson's review of Shedinger as the most negative book review known in our area ("Reading this book fills one with dismay and despair. It is shocking that a work which does not rise to the level of a master's thesis should be approved as a doctoral dissertation; how it found its way into print is unfathomable" etc.). After reading Paul Foster's review of Bartosz Adamczewski, Q or Not Q? The So-Called Triple, Double and Single Traditions in the Synoptic Gospels (Frankfurt am Main: Peter Lang, 2010), I am beginning to wonder whether this one now wins the prize and betters Peterson. Unfortunately, while initial hopes may have been high for the project this book seeks to undertake, the outcome is not only disappointing, it is quite frankly bizarre, idiosyncratic, self-indulgent, unconvincing, lacking in academic judgment, implausible at every turn, methodologically flawed throughout, and poorly written. It demonstrates no critical awareness of the handling of sources, resorts to ad hominem presentations of the positions of various scholars, and cobbles together the most implausible array of historical interpretations. This unsurprisingly results in what may be the most worthless attempt to find a fresh solution to the synoptic problem in recent years. What is truly disheartening about this amateurish and unscholarly book is that because it is the only monograph-length defense of Matthean posteriority, it may be viewed as the major presentation of that theory. Reading this work one does not know whether to roll around with laughter, or to weep with genuine pain. For this reviewer it is the second of those responses that was more prevalent throughout this book. How could a supposedly academic book, published by Peter Lang, a reputable scholarly publishing house, ever see the light of day? There has been a serious deficiency in quality control. This book shows no connection with, or appreciation of any form of mainstream scholarship on the synoptic problem. Opposing views are misrepresented and never sympathetically handled, even though they have far more cogency than the ideas expressed here. The approach is devoid of rigorous analysis of texts, but characterized by unfounded assertions and claims that the most implausible readings are self-evident. Adamczewski has the distinction of producing a book that makes Dan Brown’s Da Vinci Code look like carefully researched and highly rigorous historiography. I wish that Paul would stop beating around the bush and tell us what he really thinks. Like many others, I was very sorry to hear yesterday of the death of Alan Segal, news I saw first on Jim West's blog and Jim Davila's blog, and then comments by James McGrath and tributes by April DeConick and Jared Calaway, and another today by Larry Hurtado. Further comments by Nick Norelli, Deirdre Good, Loren Rosson and John Byron. On my commute into work this morning, I listened to a fascinating programme that was on Radio 4 about three weeks ago, The Honest Musician's Fear of Accidental Plagiarism (sadly no longer on iPlayer) [Edit: Available again on iPlayer from that link!, 29 October 2015]. It discussed the question of musicians inadvertently plagiarizing others' material. It began with a great story told by Guy Garvey from Elbow about how he accidentally stole one of his best lines, "Oh, kiss me like the final meal", from another song, and about how he confessed to the artist who charged him "one beer" for the offense. I began to wonder how far this is a problem in our area. Are we ever involved in "accidental plagiarism"? On one occasion I used the line "that with a sharp enough scalpel, everything is unique" in what I thought was an echo of a thought of Michael Goulder's. I later found the practically identical line in his work -- "With a fine enough scalpel, everything is unique". In cases like this, I think it's a bit closer to homage than plagiarism, but it is a fine line. And I bet I've done it on other occasions without noticing. I have noticed a large number of occasions where scholars have borrowed actual phrasing from James Robinson's brilliantly told stories of the discovery of the Nag Hammadi tractates. One of the lines he uses, "the ultimate act of blood vengeance", is found in many retellings of the story, sometimes with minor variations like "quintessential act of blood vengeance" (Meyer) or "extreme act of blood vengeance" (Ehrman), but more often just as it is in Robinson. The difficulty is that the influential telling of the story is so powerful that the wording can stick. As usual with archive.org, you can download as PDF, read online in flipbook format and so on. For earlier comments on the availability (and non-availability in some places) of the English translation of Paulus, Paul, see comments over on the NT Gateway blog and here on the NT Blog. I really like "veriest" and I like "veriest conjecture" even more. A quick google search suggests that the phrase is indeed somewhat archaic, with instances occurring early in the 20th century but falling into disuse thereafter. I might see if I can sneak it into my writing somewhere. NTWrong is a former pastor, whose son is now attending Bible College. New Testament Commentary Survey is written with Mr. Wrong’s son in mind as the primary audience. There is no reason to suppose that thousands of people will make their way to this blog. However, Mr. Wrong hopes the site will be of utility to the occasional individual who stumbles across it. It's interesting that the author is apparently unaware of real Wrong. Perhaps the early Christians similarly hit on the idea of being pseudo-Paul independently of one another. Thanks to Mike Grondin on the Gospel of Thomas e-list for the link. Tony Burke and Phil Harland have been busy arranging a special colloquium on the Secret Gospel of Mark at York University (to be held Friday, April 29, 2011). We would like to invite scholars and students who are interested to attend. The public is also invited to the evening session. Featuring: Scott Brown, University of Toronto; Tony Burke, York University; Bruce Chilton, Bard College; Craig Evans, Acadia Divinity College; Phil Harland, York University; Charles Hedrick, Missouri State U.; Peter Jeffery, U. of Notre Dame; Marvin Meyer, Chapman University; Allan Pantuck, U. of California; Pierluigi Piovanelli, U. of Ottawa; Hershel Shanks, Editor of Biblical Archaeology Review. I am happy to say that I have had two paper proposals accepted for the SBL International Meeting in London in July. The first may be familiar to regular readers of the blog because it is something I began to brainstorm here. The second is in a section shared with James McGrath so with any luck we might even be in the same line-up. A Walking, Talking Cross or the Walking, Talking Crucified One? A conjectural emendation in the Gospel of Peter 10.39, 42. The Gospel of Peter famously presents the reader with a bizarre resurrection account in which a walking, talking cross emerges from the tomb (9.34-10.42). If the image were not already absurd enough, the difficulty is compounded by the lack of precedent for it in the text, with its ordinary, inanimate cross that does not enter the tomb with Jesus. If we conjecturally emend the text from σταυρον to σταυρωθεντα, from "cross" to "crucified", the difficulties are resolved. Conjectural emendations should not be proposed lightly, but our only witness to this passage, P. Cair. 10759, is late (eighth century) and riddled with errors, including many in this context. If the exemplar had used the nomen sacrum ΣΤΑ (cf. 0212), it is easy to imagine how the scribe might have misconstrued this as abbreviating "cross" rather than "crucified". On this reading, it is "the crucified one" who has been preaching to the departed souls and whose voice is heard. Jesus is the chief character in his own resurrection account and is not upstaged by his cross. How Reliable is the Story of the Discovery of the Nag Hammadi Codices? The story of the discovery of the Nag Hammadi Codices in 1945 has attained near canonical status in scholarship of early Christianity. James Robinson's compelling narrative of how Muhammad 'Ali al-Samman and his brothers unearthed the jar containing the codices combines skilled investigative journalism with tales of intrigue and blood vengeance. Few appear to have noticed, though, that there are several different versions of the story, including a two person version (1977) and a seven person version (1979), with subtle variations including the identity of person who first found the jar. Now, newly unearthed footage from a 1987 television series, apparently unknown to contemporary scholars of Nag Hammadi, sheds new light on the circumstances surrounding the discovery of the documents. The Channel 4 (UK) series, The Gnostics, features Muhammad 'Ali himself, in his only known appearance in front of camera, offering his account of the discovery. Although there are several points of contact with the earlier versions, there are also several major points of divergence, which raise fresh questions about the reliability of 'Ali's testimony. NT Pod 49: What is the Third Quest of the Historical Jesus? The latest episode of the NT Pod came out last night and the topic this time is What is the Third Quest of the Historical Jesus?. 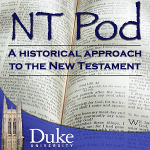 It is the latest in the current series of podcasts on the Historical Jesus that I am running alongside my course on the Historical Jesus at Duke this semester. Find the rest on the Biblical Greek Youtube channel. These are free public lectures. No pre-registration is necessary. Richard Bauckham was until recently Professor of New Testament Studies and Bishop Wardlaw Professor in the University of St. Andrews, Scotland, and is now Professor Emeritus at St. Andrews. He retired in 2007 in order to concentrate on research and writing, and is Senior Scholar at Ridley Hall, Cambridge, where he does some teaching for the Cambridge Federation of Theological Colleges. He is also a Visiting Professor at St. Mellitus College, London. From 1996 to 2002 he was General Editor of the Society for New Testament Studies Monograph Series. He is an Anglican (but not ordained), and was a member of the Doctrine Commission of the Church of England for some years. In 2009 he was awarded the Michael Ramsey prize for his book Jesus and the Eyewitnesses, and in 2010 the Franz-Delitzsch-Award for a volume of collected essays, The Jewish World around the New Testament. His other publications include God Crucified: Monotheism and Christology in the New Testament (1998) and The Theology of the Book of Revelation (1993). Please contact Jacquelyn Norris at (919) 660-3529 with any questions. With an emphasis on textual reception history, the 1st St Andrews Graduate Conference for Biblical and Early Christian Studies is aimed at graduate students and early career scholars. Contributors are welcomed from the following fields of research: Old Testament / Hebrew Bible, Pseudepigrapha, Dead Sea Scrolls, New Testament and Early Christianity. Further details are available at http://www.st-andrews.ac.uk/divinity/rt/conf/atrh/ and in the attached conference poster. Mentioned already, of course, by Jim Davila over on Paleojudaica. Looks like an excellent occasion. And most importantly, it mentions the NT Blog a couple of times. It's nice having NT Wrong fronting it again. And there is also the latest of the new Top 10 by votes chart, with congratulations to James McGrath for the well-deserved top spot, and Bob Cargill (nicely caricatured) at number 2. NT Blog, though, is nowhere in sight. Belated New Year's Resolution: must do better! Over on Abnormal Interests, Duane sings the praises of the New Athena Unicode Font. Another word in its favour for scholars of antiquity -- it has a fine Coptic font and so is ideal if you work on Nag Hammadi codices and so on. I have found it a lifesaver for constructing synopses of the Gospel of Thomas and the Synoptics, where one needs Coptic alongside Greek, and it is the best way I have found for getting things lined up properly without line-alignment going nuts and driving you mad, which happens when you combine different fonts in Synopsis. Update (22:14): In comments, Jon recommends Antinoou: A Standard Font for Coptic. I have downloaded and given it a whirl and it's definitely a nice looking Coptic font and in many respects superior to New Athena Unicode. Its Greek is a little less pleasing to the eye, but it does render my Greek / Coptic Synopses of Thomas and the Synoptic successfully, so it is going to be a competitor to New Athena -- no question.